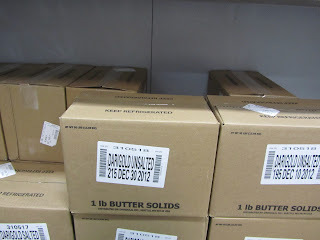 I've mentioned before that I shop at a restaurant supply for many of our items. I thought you might like a better picture of what shopping at my local cash and carry looks like. The name of this particular chain is United Cash and Carry. There are others around the country, one other I know is Smart and Final. They specialize in large, institutional-size packaging. Imagine if you ran food service in a cafeteria, or you were planning a picnic for 200 people at your church, or you had a small bakery. This is the sort of place you'd shop. And just so you know (so you don't look like the total dolt that I did as a first-timer), flatbed carts pull, and don't push (at least not in a straight line). Most of the people I see shopping here have their carts loaded up with things like 40 pound boxes of chicken, a case of cabbage, 250 burger buns, 50 pound sacks of grains, etc. It's clear that they are shopping for some sort of business, or a very large gathering. 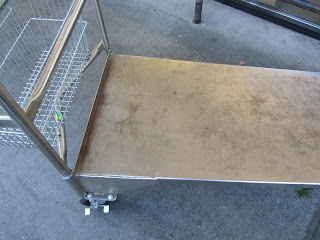 There are always a few carts like mine, maybe with a couple of 50 pound sacks of grains, or a case of butter. But there are telltale signs that I'm just shopping for a family -- like the 10 bananas, or single (normal-size) container of salt, or just a 2-gallon box of milk. 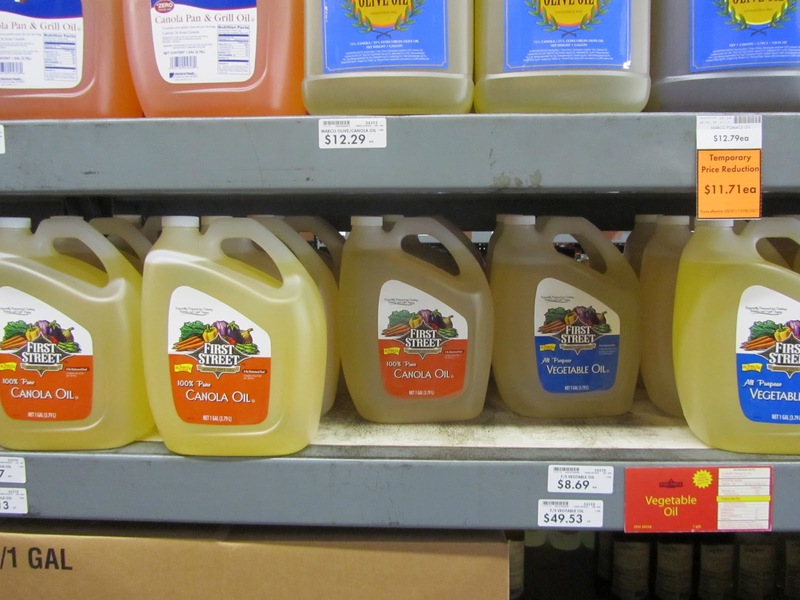 You can buy many items in packaging more consistent with traditional grocery stores, like a 1 gallon jug of oil. 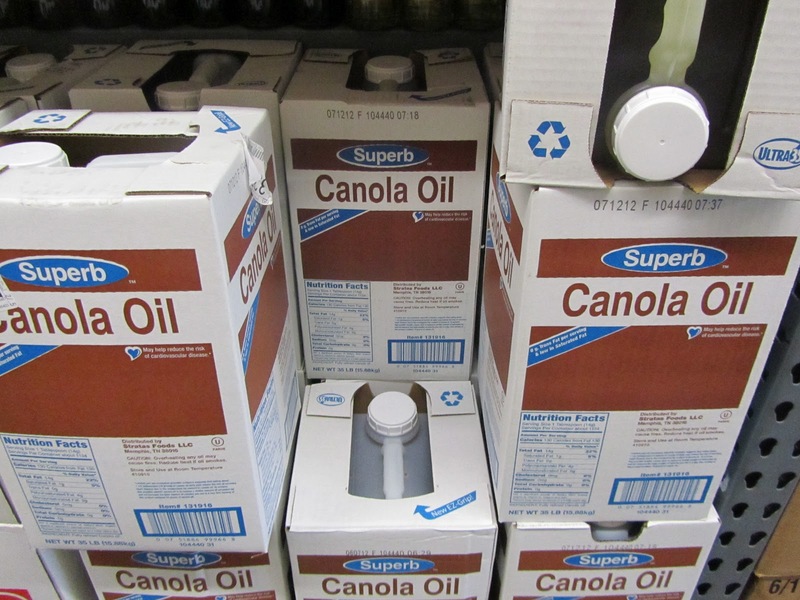 Or, you can buy the econo-box of oil -- 35 pounds, or 4.375 gallons, for a savings of about $1 per gallon. Three years ago I did buy the 35 lb. box of oil. This was during another price spike in oil prices. I saved about $10 over buying the same amount of oil in a gallon jug. The only downside was dispensing the oil. I had to decant from the 35 lb box into a 1 gallon jug, to make it usable in a home kitchen. 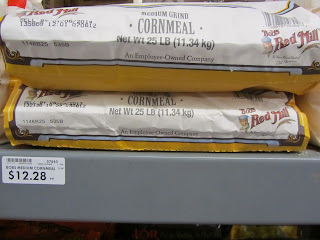 Oats and cornmeal come in 25 lb. sacks. We eat a lot of granola, hot oatmeal cereal, and oatmeal cookies. A 25 pound sack lasts us(a family of 5) about 4 months. There's no unit pricing in a wholesaler such as this one. You need to be sharp in math, or bring a calculator. I bring two calculators, my teen daughters, who need to keep their math minds sharp at all times! 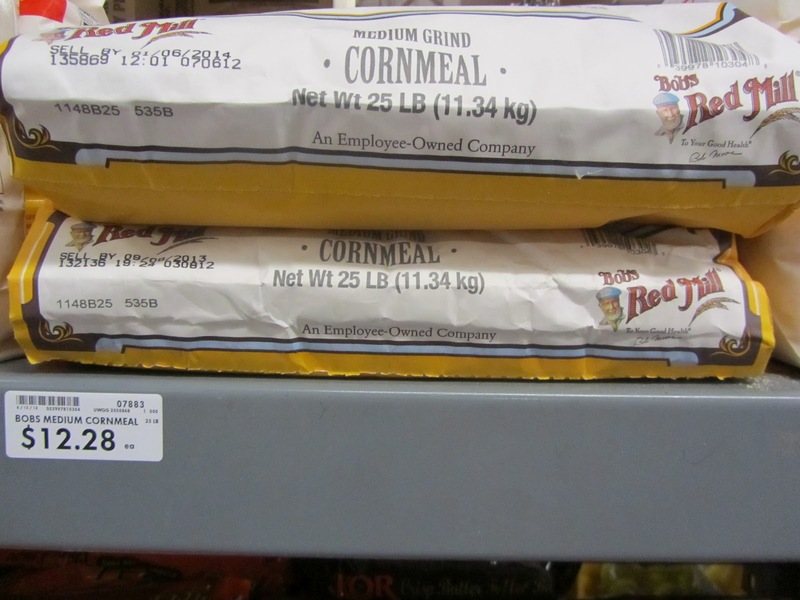 That $12.28, on the shelf edge, is the price for 25 pounds of cornmeal. That works out to about 49 cents per pound. I buy white sugar in 50 pound sacks. Sugar prices have come down just a bit in the last 4 months. 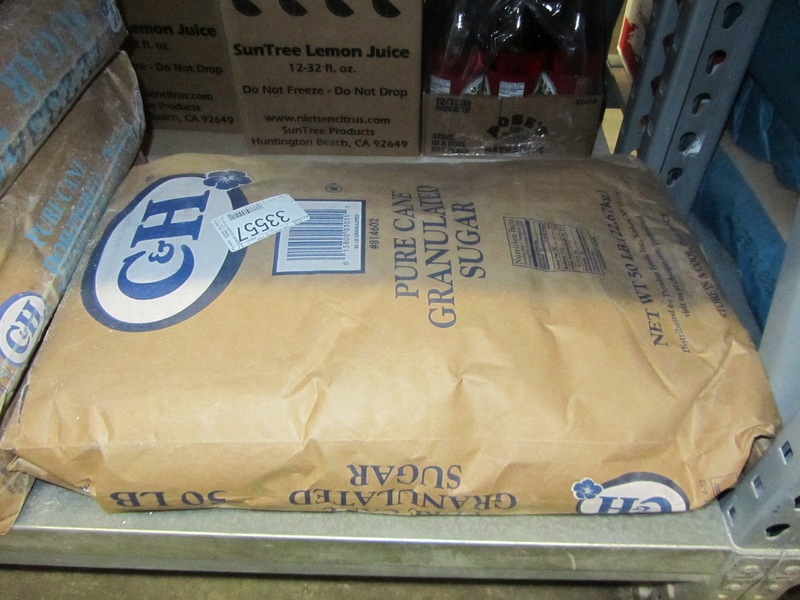 A 50 lb sack of sugar was about $26 the other day, down from a high of $28.50 last May. I no longer buy brown sugar in 50 lb. sacks. I found my family was "snacking" on brown sugar, and wanted to cut that habit short. Instead, for brown sugar, I buy molasses in a 1 gallon jug and mix my brown sugar as I need it. I buy both whole wheat and white flour in 50 pound sacks, as well. I bake a lot. I can go through a 50 pounder in about 3 - 4 months. 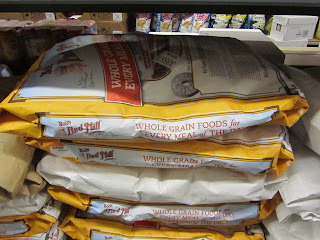 I paid $16.48 for a 50 lb sack of whole wheat flour in June. That was a sale price. Yes, they do have sales at our cash and carry. 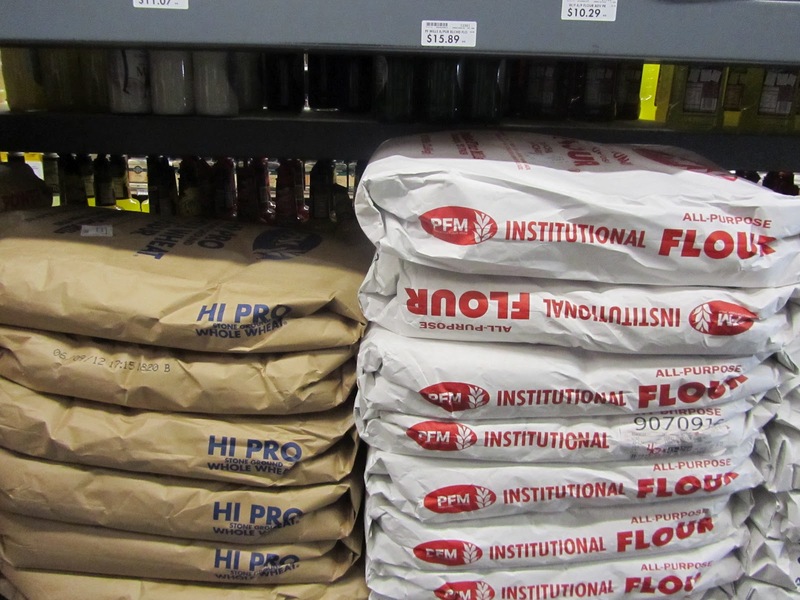 The price on flour worked out to about 33 cents per pound. Interesting to note, some of the white flour labeled for institutional or hotel use is unsifted. It is not as lumpy as white flour once was, but it still needs a bit of whisking in the bin to fluff it up for accurate measuring. 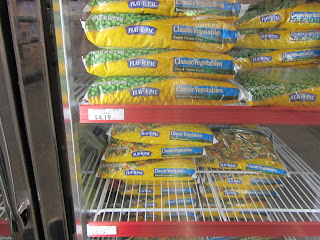 Frozen vegetables come in 5 pound bags. 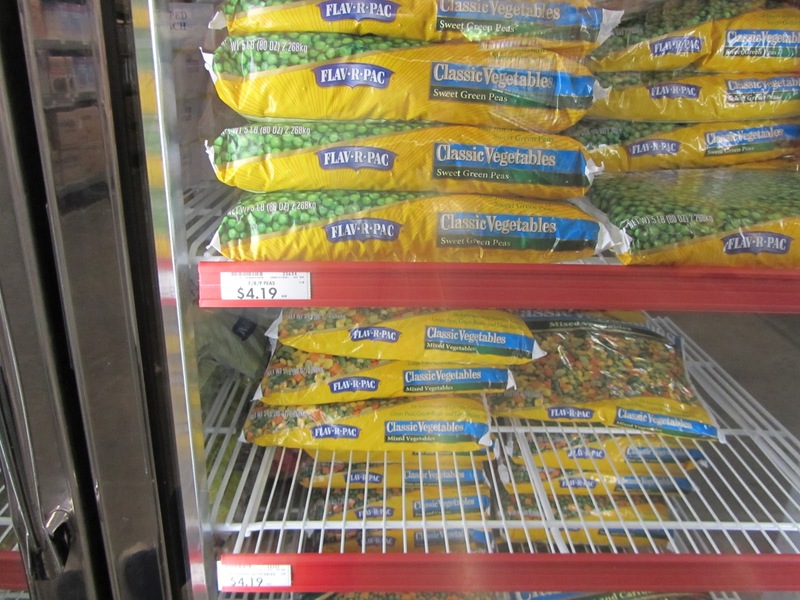 I can often do better price-wise with loss leader sales just before Thanksgiving for frozen vegetables. But when I need frozen veg, and they're not on sale, it's nice to know they are here at a price I can count on -- roughly 85 cents per pound. "Oats, peas, beans and barley grow, oats peas, beans and barley grow. . ."
I can't help but sing that song every time I go down this aisle. Dried whole grains, like brown rice and barley, and legumes are sold in 25 and 50 pound sacks. I buy pintos, split peas, lentils and garbanzos this way. Legumes keep well for at least a year. I have heard of other folks having a hard time getting old beans to soften in cooking, but I've never had that problem. Perhaps buying from a wholesaler I get "fresher" beans, I don't know. Canned tomato products are a deal here. Canned tomatoes can be frozen. So when I open a can for a batch of chili, I package the rest into meal-sized containers and freeze. I also tend to big batch cook, so when I make spaghetti sauce, I MAKE SPAGHETTI SAUCE. I use an entire big can (about 105 oz.) of tomato paste, for a big batch of sauce. or by the more convenient 4 to 5 pound jar/can. 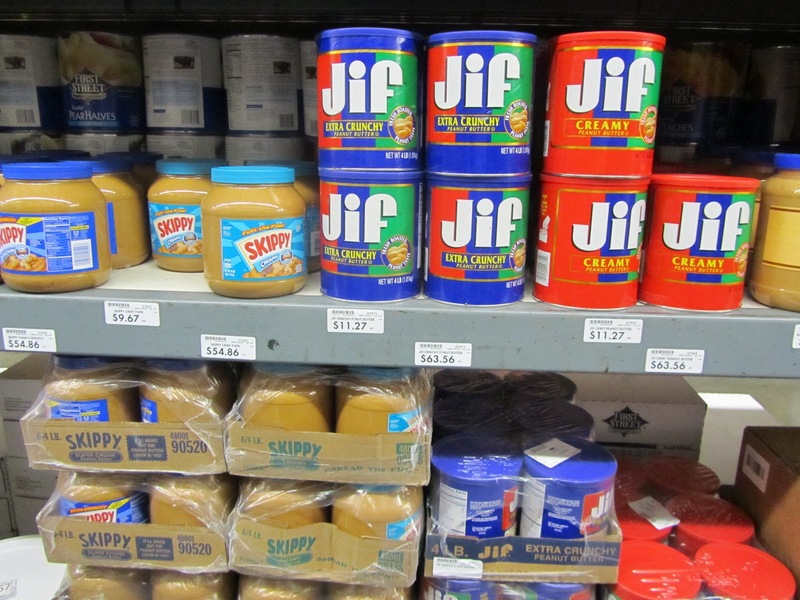 But if you don't need peanut butter right now, wait about 2 months to see what prices do. This year's peanut crop looks very good, and prices should come back down to a not so crazy level this fall. 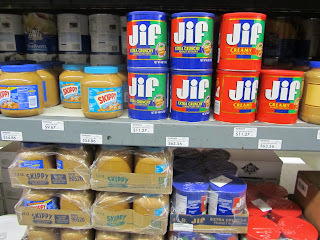 Seriously, we were in Albertson's this morning and peanut butter, a 16 oz. jar, was selling for almost $5. Now that is crazy! The dairy walk-in is not such a deal, with the exception of butter and margarine. Butter, in a 30 lb. case, sells for about $1.85 lb., and margarine, also in a 30 lb case, sells for about 85 cents lb. I will say, in fall, with all the baking sales at a regular grocery store, I find margarine for less. But the rest of the year, I buy butter and margarine by the case. Both freeze well, and will stay fresh tasting for 6-8 months if frozen. Why would I shop here? Well, overall it's cheaper on the staples that I use in large quantities. They save by not having the fancy displays or ambiance. There are no shopping bags. They do have some boxes that you can help yourself to, if you want. They will get something down from a shelf, if needed, and offer regularly to help me out to my car (and I see them doing this for other customers, so I know they're happy to help). The line can get long. There's no "Three's a crowd" policy here. If you hit the store at just the wrong time, there could be 6 - 8 carts ahead of you. But most of the time, my wait is short. There's no coffee bar to get a quick fix of caffeine. Very rarely are there any samples offered. It looks like a warehouse inside. And because of all this, they save on their overhead, and pass that savings on to me, the customer. Do you have an extra freezer? How do you store all of this food? Do you have giant air-tight containers for the dry stuff to keep out bugs? Yes I have a spare freezer. I have a small, dishwasher-size freezer in the garage, and our old fridge-freezer in the garage. But I store most of the dry staples in the pantry. 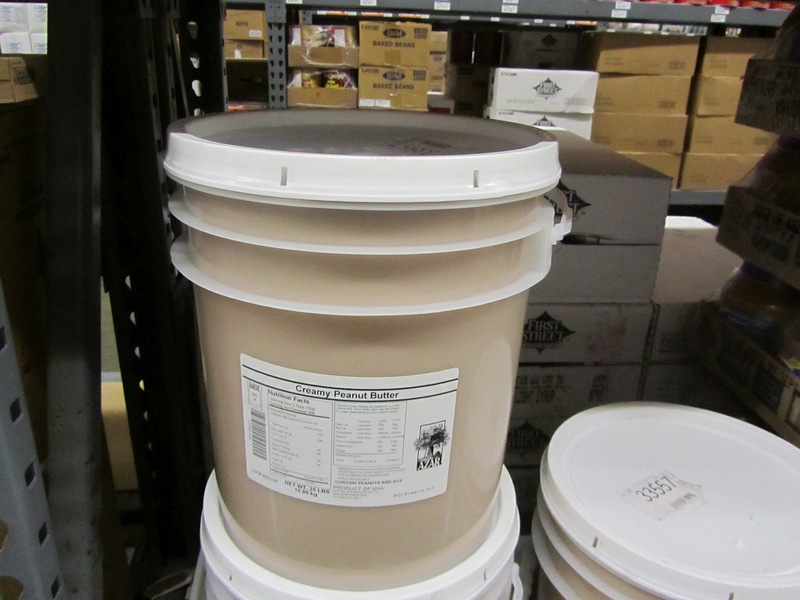 I have a couple of large plastic food storage bins, for grains. And smaller 1-gallon plastic containers for legumes. A fair amount of the time I have something still in a paper bag. I had a pantry moth problem once, a year and a half ago. The pantry moths came in to my house in a 50 lb sack of rice. I caught the problem right away, and that was the end of it. I no longer buy that brand of rice in 50 lb sacks, and only buy rice in 25 lbs now. The problem is not keeping existing bugs in our house from getting into our food, but preventing bringing new bugs into our home. There's a way around all this. If you freeze your grains for 24 hours when you first bring them into the house, you kill anything foreign before it matures. You don't have to do this all in one big freezing effort, but can rotate stuff in and out over the course of a week. 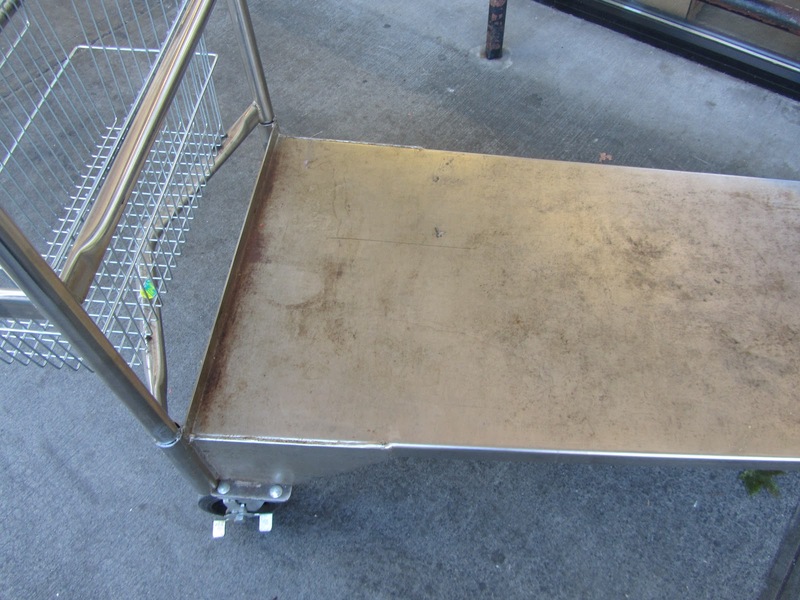 In my experience, pantry pests have been more of a problem coming from supermarkets than from restaurant supplies. And, as you pointed out, having a hungry family means that I go through all this in a short time. This type of shopping is not just for large families, though. I've known singles and couples who shopped this way and began coops with friends. They share the wholesale pricing, but don't have to have a 50 lb sack of anything sitting in their kitchen. We have a Cash and Carry about an hour and a half from here. Is it a membership store like Sam's Club? I have tried the oil in bulk from Sam's. We actually love to have it on hand just because of the distance we're back to driving. I sort of feel like as long as I have the staples on hand we could always eat. My husband patiently fills up a smaller bottle for me every time I run out. I can't lift the big jug to pour it..lol. No membership fee. It's like Business Costco, but without the membership! The Cash and Carrys in our area are open to the public. Give the one in your area a call and ask if they sell to the public. 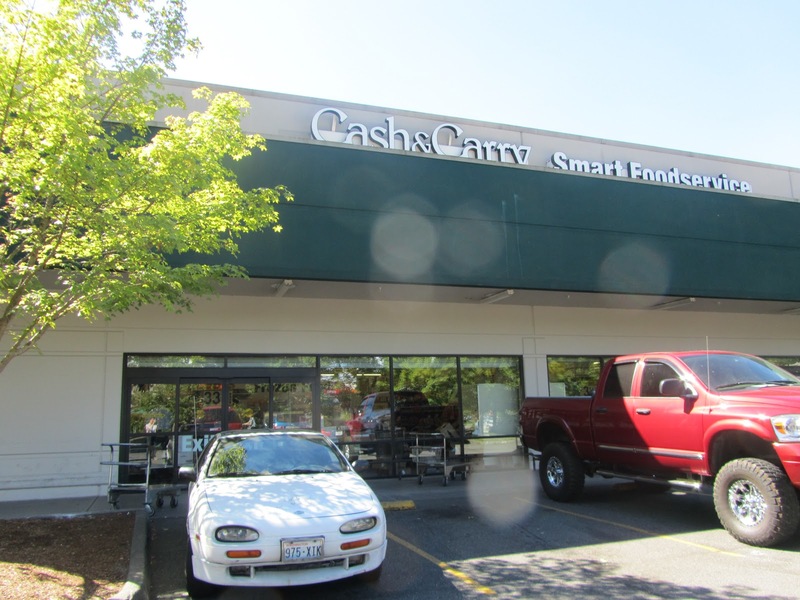 About 15 years ago we had to pay cash (hence the name "Cash and Carry"), but they now take credit and debit (no personal checks). I feel the same way about having staples on hand. I can make something at least, if I have a bunch of pantry staples. Your husband sounds extremely kind and helpful. I can tell he appreciates all you do for your family. Our Cash and Carry is a bit of a drive , maybe 20-25 minutes away. But during the school year, I am out that way anyways. During the summer I make the trip just twice, and really stock up on staples. It's nice to not have to grocery shop very often. I would love to shop at a store like this!!! There are some very good prices in there, Lili. 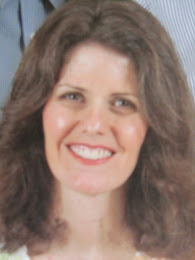 :) I enjoyed reading your entire post. And I have wondered about peanut butter myself. this is usually the time for back to school sales on peanut butter and I have seen none! I picked up a jar yesterday and it was close to $5 too. Sale papers come out today and maybe they will be in there, but I am doubtful. We are rationing the peanut butter and still eating homemade sunseed butter. But this year's peanut crop looks very good. Farmers planted more acreage in peanuts this year over last, and the weather has been favorable. The peanut crop gets harvested in October, I think, and if it is as good as it looks now, then prices should drop by late fall. Keeping my fingers crossed! Do you know what I love about shopping at a restaurant supply (on a long list of things I love about it), coming home with a large supply of basics. It reminds me of the Little House books, when they'd get all stocked up for winter. Just a cozy thought. Totally agree! The less I stop in at the grocery store, the less I spend. Even when I'm really trying to stick to a list, I still wind up spending a lot more for the month than if I do a big stock-up for basic supplies, then go out and pick up just the loss leader items as I see something really well-priced. You've just pointed out that just about every community has someplace to shop, where you can save money on groceries. In your area it's the store run by Mennonites, in mine, as I live near a major city, it's a wholesaler. To be honest, I'd rather give my money to the Mennonites than a large corporation. But this is what I have. That's a fantastic price on organic oats! That works out to about 46c a pound. Even at the Cash and Carry I'm paying over 50c a pound for non-organic oats. And you're right about being able to find grocery store prices that beat some of the warehouse stores. I try to keep an eye on the loss leader sales at our grocery stores. I can get great prices on many items in the late fall, right around Thanksgiving. Lili have you tried Manna Mills in Lynnwood? They carry a LOT of bulk food and products I've never seen anywhere else. Yes, Manna Mills is just across Highway 99 from my daughters' school. That's where I go when I need something unusual like xanthan gum or buckwheat flour. But I do find that I spend a lot whenever I go there. You're right there have a huge selection of the less common ingredients. What items to you buy there? Once school starts up again I'll probably be making a swing by there. Its a little out of the way for me but I once had to make a sugarless wedding cake and found all the ingrediants for both cake & frosting there. If I'm in the neighborhood I sometimes just stop by to check it out. I like that I can buy small or big quantities of stuff. I like the old country store feel of the place. Totally agree! I love that I can buy just a couple of tablespoons of something there. 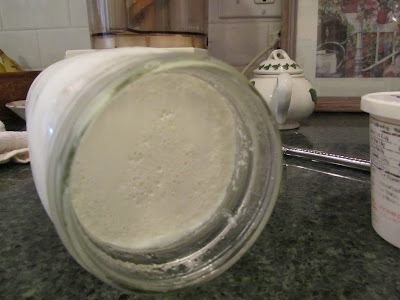 When I needed xanthan gum I didn't want a whole bag of it, just about 1 tablespoon. I'll have to stop in next week, just to check some of their prices on my regular staples. Thanks for reminding me of the place! Wow. You buy a lot of food at once. Hard to tell how much food waste we would have if we bought that much in bulk at one time. However, we don't like to bake and cook as much as your family does. 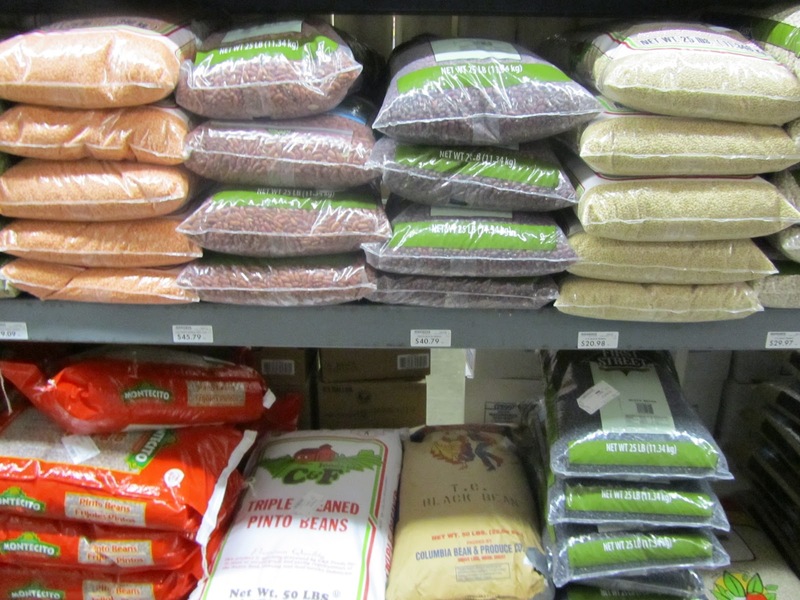 Most of what we bulk buy are pantry staples, so waste isn't really an issue with that for us. And I only buy one or two big bags in any given month. By the time the next month rolls around and I'm buying something else, the stock of the big bags I'd bought the month before is greatly depleted. But yes, we bake and cook a whole lot. And we eat vegetarian more the half the nights of the week (all those beans and grains). I don't shop for a week at a time, as most households do. But instead replenish stock of staples, so I can throw together any number of dishes with what's on hand. It's just a different shopping/planning style is all. And may be all wrong for someone else. Wow, that is a huge stockpile! 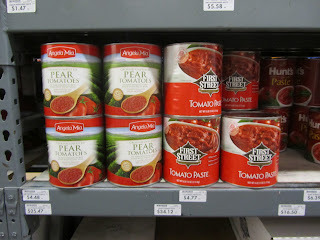 I would love to stock up on stuff like that but unfortunately we are plagued with pantry moths. I thought I had gotten rid of them over winter, but they have just reappeared, though funnily enough in the living room and not the kitchen. We live in quite a warm climate and I have tried everything to get rid of them, but they just keep breeding. I'd still like to buy some stuff in bulk though. I think there is a cash and carry place near us - I also think you have to have an ABN (Australian Business Number) to shop at them, but Mr Omnivore has one, so I might give it a try. It would be good to stock up on vinegar and bicarb soda if nothing else. have you tried pheremone lure pantry moth traps? When we first moved into our house, the cupboards had moths. I used the traps, kept everything in plastic containers and got rid of the moths in a few of months. You have to be persistent with the traps, replace the lures, and keep at it for a while. You have to go through a couple of life cycles of the moths to get them all. The traps will work in your living room as well. You could place them behind furniture, under end tables. Good luck with that. Yeah, the cash and carry has a lot of other stuff priced well. I buy sesame oil there, in relatively small bottles, for about half what I pay in a grocery store. Soy sauce, vegetable oil, and vinegar in the gallon jugs are also a good deals there. Our cash and carry has decent prices on restaurant quality utensils and bakeware, as well. And if you are ever hosting a large gathering, don't forget to check there for all sorts of supplies. What ratio of molasses & sugar do you use to make your own brown sugar? I'm not sure exactly. I drizzle a little molasses over the top of a bowl of sugar and stir to thoroughly blend. I think it looks like about 2 teaspoons to 1 tablespoon of molasses to 1 cup of white sugar, for golden brown sugar and about 1 1/2 tablespoons to 2 tablespoons molasses with 1 cup of white sugar for dark brown sugar. I stir with a spoon, using the back side of the spoon to thoroughly mash the molasses into the sugar, and store what ever is leftover in a tin in the cupboard, so I often have some all made. If I'm making something that doesn't have to be precise, like granola, I just add the molasses and white sugar separately to the sugary base.